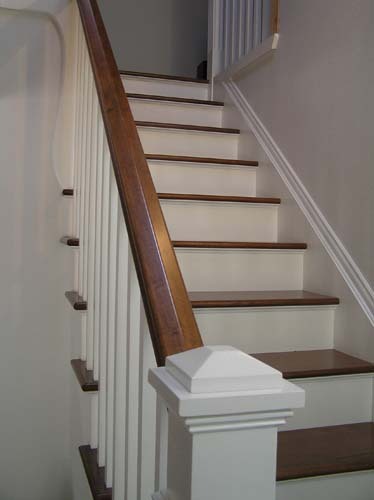 If you have recently installed maple hardwood flooring in your home and are looking to remodel your carpeted staircase to match, Stair-Treads.com offers quick and do-it-yourself solutions to converting carpeted stairs to maple hardwood. With maple retro treads from Stair-Treads.com you no longer have to reconstruct your entire stair in order to convert it to hardwood. Our maple retro treads are designed to fit over your existing stair case. Simply pull up the carpet from your stairs and then install our maple retro treads directly on top of your existing step. Retro treads are designed as a do-it-yourself installation product, so converting your carpeted stairs to maple hardwood is a simple project. If you have stained maple hardwood flooring the low country maple collection from Stair-Treads.com is the perfect solution for matching your new stairs with you flooring. Offering a selection of four maple stain colors, the low country maple collection is designed to match popular stain colors typically applied to maple flooring. These four stain bold stain colors will add eloquence and beauty to any home. Order our low country maple sample pack to receive a sample of our four maple stains, so you can find the best match possible for your maple flooring. Our maple stain colors are available on stair treads, risers, and stair parts so you know longer have to worry about the messy and time consuming process of staining and finishing your treads by hand. All of our maple treads are finished with our specialty aluminum oxide finish, which will preserve the bold color of your stairs for decades to come. Our maple stain colors are also available on our landing treads and landing panels so you can seamlessly transition from your staircase to your flooring. Contact Stair-Treads.com today and our expect staff will assist you in finding everything you will need to completely convert your staircase to maple hardwood. With years of experience our friendly and knowledgeable staff will help you add a new beautiful focal point in your home that will provide you with years of enjoyment.